Three Star Wars actors won big at the Emmys tonight. The upcoming Han Solo film’s Donald Glover took home two statues for Atlanta – lead actor in a comedy and directing in a comedy. Rogue One’s Riz Ahmed won as lead in a limited series for The Night of. And The Last Jedi’s Laura Dern took supporting actress in a limited series for Big Little Lies. Star Wars fans have several categories to watch at the Primetime Emmys this year. The two big ones for the franchise are Rebels with a nomination for Outstanding Children’s Program, and The Star Wars Show for Outstanding Short Form Variety Series. But when it comes to numbers, there are Star Wars folks all over the map. The late Carrie Fisher is up for Outstanding Guest Actress in a Comedy Series for her role on Amazon’s Catastrophe. The Bright Lights documentary that focused on Fisher and her mother, Debbie Reynolds, also got two nominations. Donald Glover’s Atlanta got a total of six nods, including Outstanding Comedy Series and a Lead Actor, Directing and Writing nods for Glover himself. Fellow Solo castmember Michael Kenneth Williams is up for his supporting role in The Night of. Ewan McGregor goes up against Riz Ahmed for Lead Actor in a Limited Series for Fargo and The Night of, respectively. They got each got a second nod for Narrator (McGregor in Wild Scotland) and Guest Actor in a Comedy Series (Ahmed in Girls). Other Star Wars actors with nominations include Laura Dern (Supporting Actress in a Limited Series for Big Little Lies) and Ben Mendelsohn (Guest Actor in a Drama Series, for Bloodline). Game of Thrones leads the Emmy nominations this morning with 19 nods, including best drama. Peter Dinklage, Lena Headey, and Diana Rigg all got acting nominations. Meanwhile, Episode VII’s Adam Driver is up for supporting actor in a comedy series for Girls. American Horror Story: Coven also cleaned up in the miniseries category, with 17 nominations, including much of the cast. 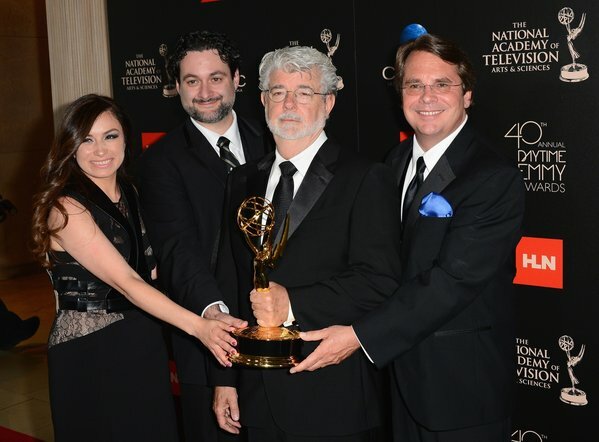 The Clone Wars wins two Daytime Emmy Awards. Outstanding Special Class Animated Program and an Outstanding Individual Achievement in Animation for Christopher Voy. Alas, not nominated was Orphan Black’s Tatiana Maslany, who’s been getting tons of buzz for her impressive work as a mind-boggling seven clones. Better luck next year? American Horror Story: Asylum is up for miniseries, as well as a nice spread in the acting categories, with nods for Jessica Lange, Sarah Paulson, James Cromwell and Zachary Quinto. Of course, the big story this year? Netflix. The Clone Wars brought home the gold at the Daytime Emmys, presented over this past weekend, taking home two awards: Outstanding Special Class Animated Program, and Outstanding Performer in an Animated Program for David Tennant as the voice of Huyang, the droid who mentors Jedi younglings in constructing lightsabers. At the main Daytime Emmy presentation on Sunday, Carrie Fisher presented the Animated Program award to George Lucas, Dave Filoni, Cary Silver and Athena Portillo for the Animated Program win. Fisher did slip in reference to dropping acid, while George had his own slip of the tongue. After switching to Saturday mornings for its final season, The Clone Wars was eligible for Daytime Emmys and earned seven nominations after the show’s cancellation. Three nominations for Outstanding Performer in an Animated Program: Jim Cummings (for voicing Hondo Ohnaka), David Tennant (for voicing Huyang), and Sam Witwer (for voicing Darth Maul) – taking up half the nominations in this category! Just putting it all into perspective: The top nominated show was The Young and the Restless with 23 nominations, and Sesame Street picked up 17 nominations, and The Ellen DeGeneres Show earned 10. But when compared to other animated shows, The Clone Wars is tied at the top with Kung Fu Panda: Legends of Awesomeness with seven each. And a shout out to Cash Cab for its two nominations – woohoo! Let’s hope that The Clone Wars takes home some Emmy gold in June, when the winners are announced. The Emmy nominations are out this morning, and yet again, there’s little love for any genre TV that’s not on HBO. Game of Thrones is up for 2 major awards: Repeat nominations for Peter Dinklage (who won Supporting Actor in a Drama Series last year, though shouldn’t he be Lead for this season?) and Outstanding Drama. There’s also American Horror Story, which is tied with Mad Men for the most overall nominations. Fandom-favorites Benedict Cumberbatch, Martin Freeman and Sherlock: A Scandal in Belgravia also got nods. The Emmys were fairly predictable tonight, at least as far as the lone genre entry went… Mad Men beat out Game of Thrones for Best Drama series, but the fantasy series did get one major award: Peter Dinklage for supporting actor in a drama! And he thanked his dog-sitter in the acceptance speech. Nice. Game of Thrones did win a Creative Arts Emmy last week for Main Title Design.